A traction motor must have high starting torque. For urban and sub urban lines, the acceleration (speed at starting) should be high. A traction motor speed control should be easy and simple such that motor can be easily start and stop. Motor should have a speed torque curve similar to that of traction load. (Traction load requires high starting torque but motors like DC shunt motor, 1 ph. induction motor etc. cannot give high starting torque. This means that the speed-torque curve of DC shunt motor, 1 ph induction motor does not match with speed – torque curve of load. Hence, we cannot use this motors for traction work). More than one motor are required for traction purpose so, we require such motors which can easily operate in parallel. Motor selected for traction purpose should have sufficient overload capacity. Motor selected for traction purpose should have small size with high power. Regenerative braking has many advantages. So, motor should be such that Regenerative braking can be easily used in it. Traction motor should handle small disturbance in supply. (Small disturbances occur when train crosses the section insulators and cross over). DC series motor has high starting torque. This is one of the most required characteristics of DC series motor. Speed control of DC series motor is easy and various methods are available for this. DC series motor has speed – Torque curve similar to that of traction load. Size of DC series motor is small. (I.e. small size and high power rating). This motor can handle overload easily. Regenerative braking can be applied to DC series motor. But with some modifications. Maintenance cost required is less. Parallel running of 2 DC series motor is difficult. Small disturbance in supply causes Inrush current (current with 2nd harmonics and high in magnitude)Hence, D.C. series motors are better for urban and suburban services. Simple and rigid (strong) construction. Regenerative Braking is easily done for 3 ph. Induction motor. High starting current is drawn by Induction motor.When motor is started at low frequency, it draws less starting current. Hence, this disadvantage is overcome. Speed control of Induction motor was very difficult till 1980. But with development of electronic devices like SCR, inverters we can easily change speed of Induction motor. Hence, this disadvantage is overcome. 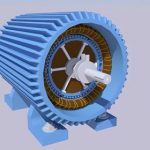 3 phase induction motor requires 3 phase supply. But transmission of 3 phase supply requires 3 wires or 2 wires (rail is used as 3rd wire). So it is costly.But in kando system, transmission is done by 1 phase system and phase converter drives 3 phase induction motor.Hence, this disadvantage of costly transmission is overcome by kando system.Hence, 3 phase Induction motors are suitable for sub-urban railway system. Following operations are performed while controlling traction motor. Smooth acceleration to avoid sudden shock so that there will be minimum damage to the couplings. Providing the variable speed according to route (track). Following methods are used for traction purpose to get above 3 requirements. For traction purpose, two motors are operated in following steps. Two traction motors M1 and M2 are started with all starting resistances in series. The starting resistances are cut out one by one and finally two motors are in series without any resistance. In series connection the supply voltage V is divided in two motors. (Both motors get half or (V/2) volts). So speed is also half. 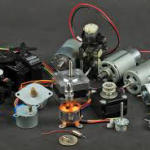 Motors are now connected in parallel with series resistance otherwise motor will draw very high current and may damage itself. Both motors are now connected in complete parallel and starting resistances are cut out one by one. In parallel connection, voltage across M1 and M2 will be full i.e. V (voltage is always same in parallel). So, voltage is now increased from (V/2) to V.
Hence, speed also increases and motor runs with full speed.